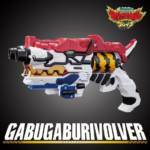 For those still keeping up with Power Rangers Dino Force Brave, P-Bandai’s gone ahead and opened up pre-orders for the DX GabugabuRevolver & GabuGaburiCalibur Set, and with that, we now have new release info. As the title suggests, both gun and sword will, of course, be included in the set along a Cannontyra Zyudenchi and Zyudenchis 24-29. 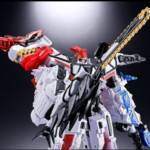 Just when you thought it was safe to put those Zyudenchi away, Toei and Korea come together to create Power Rangers Dino Force Brave, or Zyuden Sentai Kyoryuger Brave, and release a whole new set of Zyudenchi. For those who have forgotten what a Zyudenchi is, it is the battery-type gimmick from Zyuden Sentai Kyoryuger (aka Power Rangers Dino Charge). Shown in this image here are four of the new Zyudenchi from this spinoff series as well as the advertised Zyuohger Zyudenchi. Will these be added to your collection? We await release details but all signs point to a Premium Bandai release in mid April. It’s not over Kyoryuger fans. 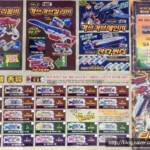 Premium Bandai revealed today at the Tokyo Toy Show an upcoming release of a diecast metal Zyudenchi set from Zyuden Sentai Kyoryuger. 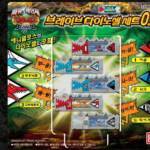 The set features Zyudenchi 1 through 23, the Topaspino Zyudenchi, as well as the +1 Zyudenchi. Orders open up June 17th and will run you a hefty price tag of 15,000 Yen (roughly $140 and change).